This tankard is made from fritware (also called stone paste and quartz paste), an artificial ceramic body developed by Middle Eastern potters around the middle of the 11th century to imitate the hard, bright white body of imported Chinese porcelains. The main ingredient in fritware was fine quartz powder made by grinding sand or pebbles. Small quantities of white clay and a glassy substance known as frit were added – the clay to give plasticity, the frit to bind the body after firing. In the 12th and early 13th centuries, fritware was used in Kashan and other pottery centres in Iran to produce fine wares decorated in an astonishing range of styles. Since fritware holds a shape well, this allowed the potters to make copy the complex shapes of metalwork vessels, as in the case of this tankard, which was probably a drinking vessel. 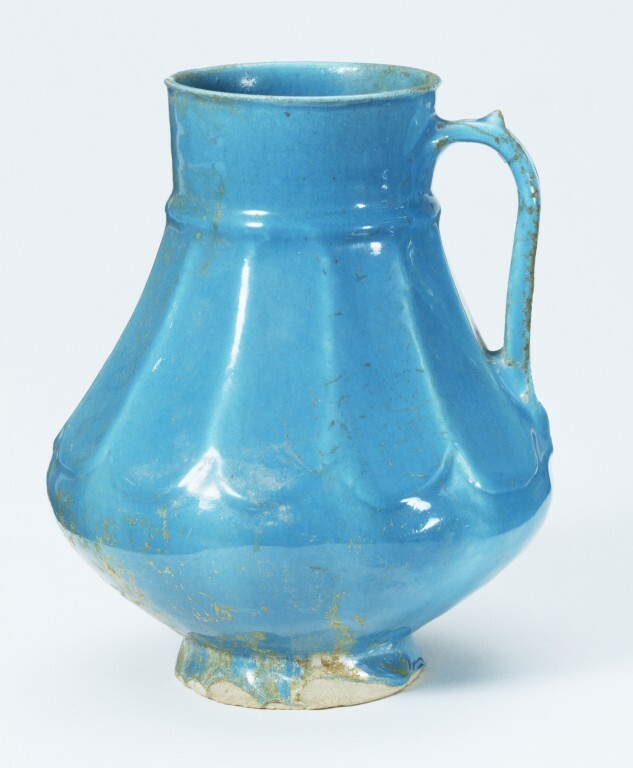 This tankard is covered with a monochrome turquoise glaze, which has been made opaque by the addition of particles of tin oxide to the glaze recipe. This gives a deeper colour to the glaze. The use of tin opacification in glazes was first invented in Iraq in the early 9th century, where it was used to make earthenware bodies appear white, like imported Chinese porcelains. After the invention of fritware, potters used a transparent glaze if they wanted to show off the whiteness of the body, and tin opacification was used instead to make richer colours. This vessel was part of a hoard that was deliberately buried by its owner, probably a merchant who lived in Jurjan in north-east Iran, or who was passing through the city. In 1220, Jurjan was threatened by a Mongol invasion. The merchant packed the vessels in sand inside large storage jars and buried them for safekeeping. Soon afterwards, Jurjan was completely destroyed by the Mongols, and the owner never returned to recover the hoard. As a result, the vessels in this hoard survived together for almost 800 years, and in relatively good condition. The probable date of their burial also gives us a good indication of when the vessels in the hoard were made, as well as showing the wide variety of types of decoration that were used to make Iranian pottery at this time. This vessel was part of a hoard that was deliberately buried by its owner, probably a merchant who lived in Jurjan in north-east Iran, or who was passing through the city. In 1220, Jurjan was threatened by a Mongol invasion. The merchant packed the vessels in sand inside large storage jars and buried them for safekeeping. Soon afterwards, Jurjan was completely destroyed by the Mongols, and the owner never returned to recover the hoard.As a result, the vessels in this hoard survived together for almost 800 years, and in relatively good condition. The probable date of their burial also gives us a good indication of when the vessels in the hoard were made, as well as showing the wide variety of types of decoration that were used to make Iranian pottery at this time. Clement Ades gave a large number of objects found in the Jurjan hoard to the Victoria and Albert Museum at different times. Their object numbers are C.152 to 171-1977, and C.35 to 49-1978. 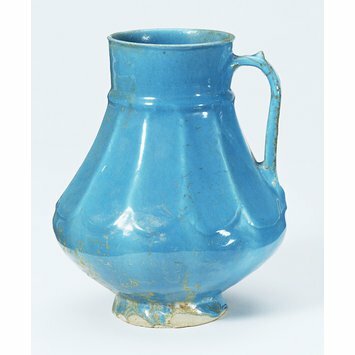 Ceramic; Fritware tankard covered with an opaque turquoise glaze. Found at Jurjan. Iran, probably Kashan, before 1220. White earthenware with tin glaze. PERSIAN (Kashan); early 13th century. Given by Mr. C.N.Ades MBE in memory of his wife Andrée Ades.